Electric Dimplex Danville Optimist Fire installed with Sherwood 56” Wood Surround in Tuscany Green. Polished black granite hearth & back panel. This stove has been installed to the Dawlish area. Looking for a similar electric stove? Electric stoves can provide you the perfect solution to heat your home at the flick of a switch. Electric stoves are an easy to use and even provide a highly realistic flame effect. 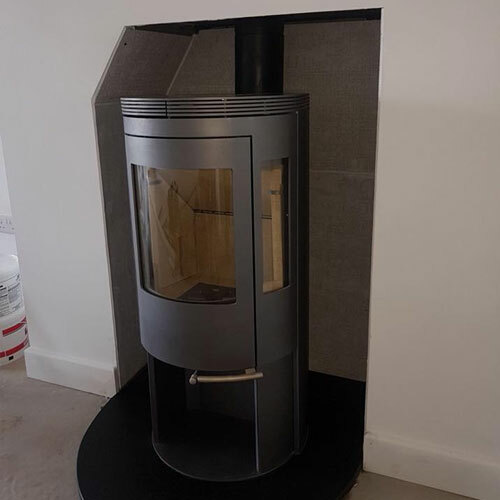 If	you wish to find out more about the stoves that our specialist stove fitters are able to provide you with, simply give us a quick call or visit us in store. Our stove showroom, is located in Dawlish, just a short drive from Paignton. Here we have on display a huge range of high quality stoves that we're are able to provide you. With this large range we are sure to be able to find you the perfect stove for you and your home.